Ubiquitous infomercial host Donald Barrett pled guilty on May 2 to charges of selling a drug not approved by the FDA (Supreme Greens) and not reporting income from another infomercial (Coral Calcium) on his tax return, as reported by the Boston Globe and the Salem News. If you watch infomercials you’ve almost certainly seen Donald Barrett and heard his distinctive Boston accent. Through his company ITV Ventures, Mr. Barrett has appeared in dozens of infomercials, sometimes as host, sometimes as expert. He has worked with Kevin Trudeau (who has been dragging out his own court case for years) and Danny Vierra of Almighty Cleanse. Nearly all of Donald Barrett’s ITV infomercials are what I like to call “grown up radio infomercials.” They sell health products which, in spite of any cursory disclaimers, are said to alleviate countless ailments. They all feature just an expert being interviewed by a host, usually without any customer testimonials or product demos added. Donald Barrett is scheduled to be sentenced on July 27 and is expected to receive a term of one year in prison. We will have to see if this legal development means the end of Mr. Barrett’s infomercial career, or if he will carry on triumphantly like his colleague Kevin Trudeau. A non-FDA-approved thanks to readers Steve D. and znkp for letting us know about the Donald Barrett story. Donald Barrett also had an infomercial telling people how to get rich by selling products on TV infomecials. 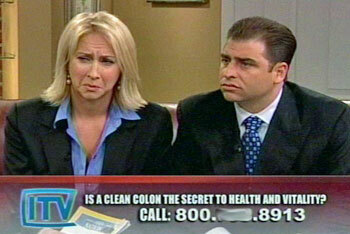 Donald Barrett is still going strong as far as his infomercials are concerned. Just before I mailed the Salem link to Paul, I watched him selling some anti-smoking “medicine” (“smoke cure, lung cure” or something like that) at about 3-00 AM on 7th May, 2011 (Pacific Standard time). @euGene: I remember that (or one like that) infomercial. One has to opt for membership with Donny by paying $199 for general (or $599 for elite) membership a month, and then one must buy items worth $129 from his company each month, in order to have, what he calls, “residual income”. Finally, for the past 4-5 years I have waited to see Joey Greco (of Cheaters fame) do infomercials, and never came across one. He is, to me, the epitome of an potential infomercial host. Now it seems he has done some infomercials (http://cheatersontv.vacau.com/indexmain.html), but I still cannot locate any more info. Can anyone please help me? I do not want to die without seeing Joey Greco doing infomercials (No, I am not dying, but I cannot express how strong the desire to see him doing infomercials is! ).